For some, school’s out for the summer, but for new students heading to SJSU, frosh orientation provides a taste of college life, including an overnight stay in a dorm room. Ready or not here they come! Up to 4,500 incoming freshmen are expected to attend this year's Frosh Orientation over the course of eight sessions (photo by Elena Polanco). For some, school’s out for the summer, but for students heading to SJSU for the first time this fall, freshman orientation provides a taste of college life, including an overnight stay in a dorm room. “Freshman orientation is a great time to talk to students and parents about the transition from high school to college and what to expect to be successful when they get here,” said Emily Bauer, associate director for the Orientation and Transitions Program. Freshmen orientation takes place annually during the summer and is in it’s 10th running. This year’s incoming class will be split into eight separate sessions, with the first held this week. What makes this freshman orientation different from most is this year’s staff is extra-spirited and close, said Bauer. This enthusiasm is paying off as the team welcomes an extraordinary large freshmen class, an expected 4,500 students. Incoming transfer and international students attend separate orientations. The two-day Frosh Orientation takes all year to plan, and although mandatory, can still be fresh and rewarding. 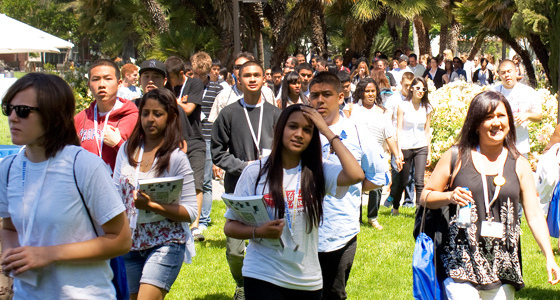 Students are more likely to succeed and graduate if they attend an orientation program. Orientation allows students to get comfortable with campus, sets up expectations for life in the classroom, and is a great way to meet other new students. Spartan parents will help their student’s transition to college run more smoothly after attending parent orientation, running simultaneous with freshman orientation. “This program shows parents how to be support systems for their students,” said Kelly De Leon-Lopez, coordinator for New Student Transition Services. Around 2,000 expected parents have the opportunity to get information and ask questions from various SJSU resources on campus, including the bursar’s office and parking services, and also learn about special interest groups, such as Greek life or study abroad. De Leon-Lopez’s hope is parents will walk away feeling comfortable sending their student to SJSU and they will know where to go in the event that their student has a question. Incoming freshman get more than a tour of the campus. They get an opportunity to learn about Spartan traditions and make connections that will carry them throughout the year. Highly trained and qualified veteran students provide invaluable assistance as orientation leaders. Each orientation leader is required to receive a B in an Orientation Leadership Studies course (UNVS 199), pass two rounds of intense interviews, and attend 40 hours of intensive training. Senior public relations major Hector Solis-Ortiz is preparing for his third year as a student leader, this time as team leader. “If I can leave a student wanting to get involved on campus doing something they’re interested in, then I’ve done my job.” Solis-Ortiz said. Click here for more information on Frosh Orientation.